Yes, Philadelphia, there is a laser comedy show and it’s going to be in town this week. Also, PHIT’s monthly tag-team show of comedic monologues and filmed sketches returns for it’s November edition. While traveling with The Flat Earth to this year’s Chicago Sketch Comedy Festival, PSF producer Brian Kelly had the pleasure of meeting Chris Fair, the man (literally) behind Laser Comedy. So when we tell you we tell you that the show that followed met all expectations and more, we are not kidding. Truly a unique experience that MUST be seen to appreciate, Laser Comedy is currently visiting Philadelphia for the annual Philadelphia Improv Festival produced by Matt Nelson. 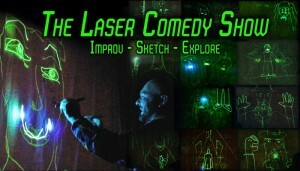 While this trip will definitely be an improvised set (and not the half sketch/half improv hybrid seen in Chicago), the product remains the same; an awesomely unique & unorthodox way to perform comedy solely with lasers. Yes, LASERS. It’s in the name, don’t act so surprised now… One night only, get there. This month, videos from Matthew Schmid (The Incredible Shrinking Matt & Jacquie / The Flat Earth), Jon Plester (Jon & Ian Have Something To Tell You), Andrew Sigwart, Kris Hodge and Deborah Acosta. If you’re a comedian with an inclination to film and edit your material, email btyb.show@gmail.com to inquire about having your video featured as part of an upcoming show. After that, it’s Monologues hosted & curated by Dru Kramcsak. This month’s performers include Sarah Clemency, Jolie Darrow (Barbara Bush), Shaun Flegal, Brian Guay, Matthew Schmid (The Incredible Shrinking Matt & Jacquie / The Flat Earth), Caitlin Weigel (ManiPedi / House of Solitude / Sketchier) and host, Dru Kramcsak.